I was afraid that it would be hard to go back to a game seven years older than the first Zelda game I had completed: The Legend of Zelda: Ocarina of Time. While the adjustment to the combat was initially difficult, I found that there’s a lot to like about The Legend of Zelda: A Link to the Past. I’m used to the combat in 3D Zelda games, where the ability to lock on and remain facing an enemy while being able to move makes it trivial to dodge attacks and quickly counter. In A Link to the Past, I found myself struggling with dodging the attacks of moving enemies, and then quickly changing directions and trying to catch up to get a strike. In order to compensate, I found myself using the ranged weapons to stun enemies or damage them at a distance, which added significant variety over my typical strategy for Zelda combat, which is to lock onto each enemy and take them out one at a time with the sword. 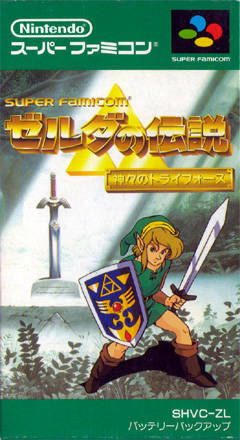 A Link to the Past also seems to use a much lighter hand when guiding the player to the next objective. Rather than the constant refrain of “Hey! Listen!” in Ocarina of Time, I was told my objective once by other characters like Sahasrahla, or given hints from the optional wall tiles in dungeons. If I needed additional information, the fortune teller was available to provide a hint, but his help didn’t seem necessary. The lack of pressure to tackle the next objective made me feel more free to take my time exploring the dense overworld, and it was very satisfying to happen upon a random item long before I would actually need it to enter a dungeon. The game placed more constraints on the my resources than more recent games in the series. Hearts and magic refills drop far less often than I’ve come to expect from Zelda games. In Ocarina of Time, every boss battle is immediately preceded by a room full of objects to break that will contain heart and magic refills, practically guaranteeing that a player will enter the fight at full strength. In A Link to the Past, there is no such guarantee. I found myself entering boss battles at half health. For one boss fight, I decided to teleport back to the beginning of the dungeon and leave to buy green potion because I found myself running out during my first few attempts. While this led to some frustration with the boss battles, I found the victories more satisfying. The game holds up very well on the whole. The overworld is large and full of secrets to find, and the mechanic of transferring between the light and dark world to use the altered landscape is a fun mechanic that’s not quite like anything else the console versions have done in recent years. It would be hard to find a reason not to recommend A Link to the Past to someone who hasn’t played it. Dan DeSmet is on Xbox Live and on the PlayStation Network as arsGappy. Follow him on Twitter.